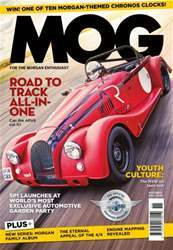 Morgans love to be on the track and the road, but can one car do both? We found out by putting racing driver, Tony Hirst, behind the wheel of the ARV6 for a road and track adventure to put it through its paces. We also head over to the swanky Salon Privé to see how SP1 would be received amongst motoring’s elite marques. On three wheels, MOG attends an event to see if a selection of three wheeled cars can fire up some young motorists. Then of course, there is a magazine’s worth of other top, Morgan-themed features.